Introduction EMSL Analytical is pleased to host this free comprehensive day-long course at their dedicated training center in their corporate headquarters. Environmental, building science and industrial hygiene professionals involved with fire and smoke damage issues, dust characterization and combustible dusts are invited to take part in a free one-day workshop being offered by EMSL Analytical, Inc. The workshop is being held on Wednesday, August 23rd and is expected to attract industry professionals from across the nation. EMSL is pleased to be offering this free course that is being taught by some of the leading experts in these fields. Instructors from EMSL include Eugenia Mirica, Ph.D., Laboratory Manager; John Newton, Senior Laboratory Scientist; John Passero, Project Manager; and Michael Menz, CIH, Environmental Training Manager. Topics to be covered include best sampling strategies and interpretation of results for fire and smoke damage investigations. A course segment will also be dedicated to dust characterization and the identification of unknown materials. This will be followed by a presentation about combustible dust testing. Following a break for lunch, attendees will be offered a laboratory tour. The workshop will finish with a final segment on sampling products and how to effectively utilize this equipment. The one-day workshop will be held at EMSL’s Cinnaminson, New Jersey training center located in their state-of-the-art corporate headquarters. The workshop will be held from 8:30 AM to 3:30 PM. This course is being offered at no cost to industry professionals. 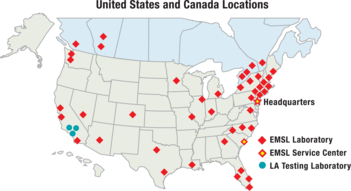 EMSL Analytical, Inc. is one of the leading testing laboratories with over 40 locations throughout the United States and Canada. EMSL is a nationally recognized and locally focused provider specializing in fast laboratory results for mold, bacteria, Legionella, USP <797>, pathogens, asbestos, lead, soot, char & ash from fires, VOCs, odors, radon, formaldehyde, indoor air quality, microbiology, environmental, industrial hygiene, radiological, food, beverage & consumer products and material testing services for the identification of unknown substances. EMSL services both professionals and the general public. EMSL maintains an extensive list of accreditations from leading organizations as well as state and federal regulating bodies. In addition, EMSL carries a wide range of sampling equipment and investigative products for environmental professionals.